Spring Training isn't just about practice and preparation. It's also about playing... And I don't mean the gameplay kind of thing. 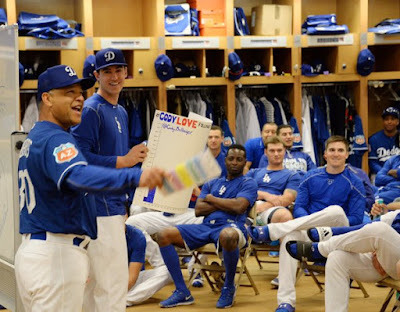 What I mean is that sometimes a little bit of fun is needed in the clubhouse and there's no better time to play around than during spring training (Kirk Gibson notwithstanding). So far, we've been treated to only an handful of photos and stories about the fun; such as the upcoming ping pong tournament. But one event recently hit social media, and I thought it was worth pointing out this afternoon. 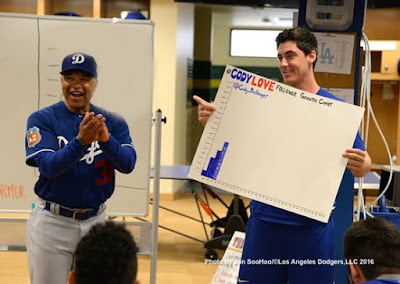 This past Friday we found out that fast-rising prospect Cody Bellinger has been tasked with boosting his twitter follower-ship, and with the help of his teammates and the fans he will hopefully fulfill his goal. From what I can tell, Cody is trying to reach 10,0000 followers. He currently sits at 4,770. 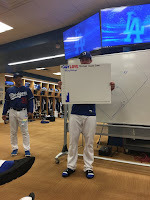 So, if you haven't already done so please go here to join in on the fun: @Cody_Bellinger. #CodyLove is now a thing! Best yet, AJ Ellis, during all the hubbub, was kind enough pass along a childhood photo of the kid on twitter, and I couldn't help but make a fantasy Baseball card using it. Check it out below. The main pic was taken by Jon SooHoo/LA Dodgers 2016. So get going Dodgers Fans! Go to your twitter now and follow the kid. And if you don't use twitter then what's wrong with you! Join it now and help move his chart (as seen below) higher! Pic at the very top via Jon SooHoo @Dodgers on twitter.